I did get the furniture project completed yesterday. Yea for me! 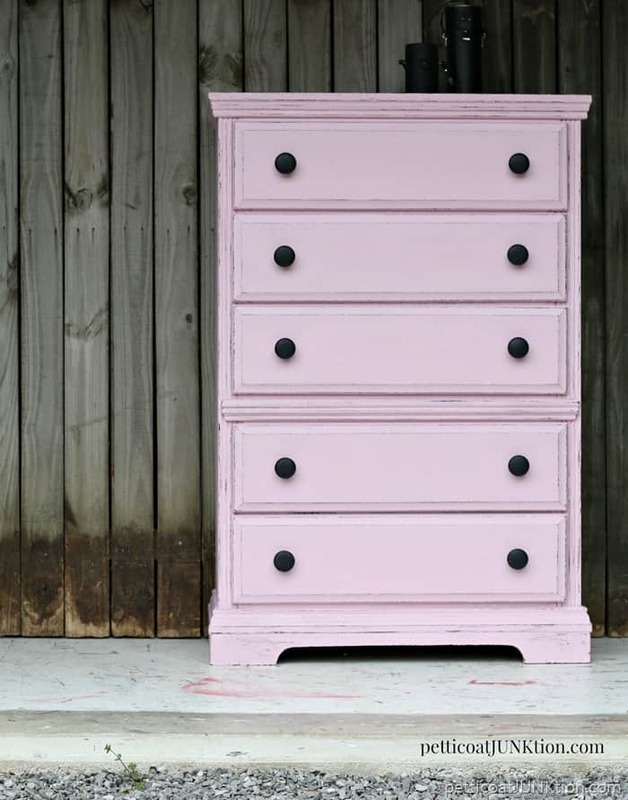 It’s kind of an edgy makeover with the bold black knobs against the light pink paint. Just the look I was going for. I love it when a plan comes together. The chest of drawers is one of the free furniture pieces from our neighbor. It looks great now but the drawers were in horrible condition and the JTS (hubby, aka Junktion Technical Specialist) repaired them for me. He actually made new runners! 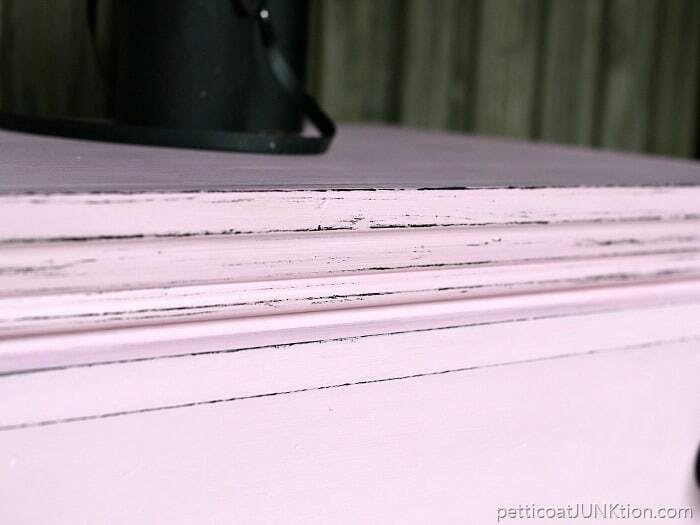 I love the look of distressed furniture when there is another color under the first layer of paint. This piece was nicely detailed. The best kind for the distressed paint look. The project was really simple. I worked on it for a couple of days but total work time was probably no more than four hours, five tops. People who don’t paint furniture usually assume it is a lengthy and time consuming task. Not true at all. I will have a lot more photos and share the paint used and all the makeover details next week. Do you like the makeover? What about the contrast between the pink and the black? Talk to me….in the comment section below (insert smiley face). I love how this came out!! The distressed with the black under is perfect!! Love your color choice for the makeover.It looks awesome. Thank you for sharing with us at #HomeMattersParty. We would love to have you again next week. Kathy, this is such a lovely make-over. Thanks for sharing. I’m new to your blog and hope to find time to pour over your previous posts. This is super cute! It would look fantastic in a teen girl’s room. Thanks for sharing at Merry Monday this week! I really like the pink and black together. I had pink and black in my bathroom a few years ago and really liked it. Very cute! I have two little girls who would LOVE something like that in their room-thanks for sharing! I want to say, you did a beautiful job on your dresser! I like the contrasting color idea but for me I would have to go with red or burgundy. I have a little nightstand that I have finally gotten ALMOST ready to paint and I have been stuck on the color choice. 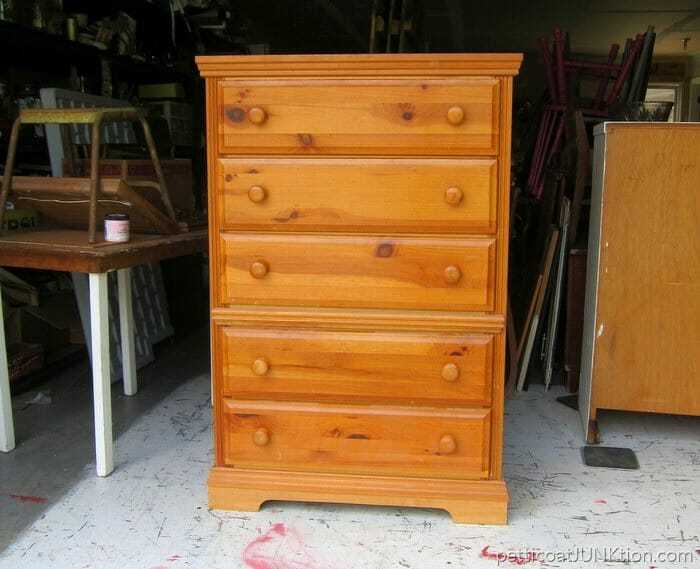 I’ve been searching for an inspiration piece just like your dresser! I have the original 1930’s yellowed lucite and “gold-tone” metal knob too! I’m thinking I’ll use it because it is “patinated” just right. That’s one thing I haven’t seen on pieces of chippy painted furniture–the painted wooden knobs aren’t chipped and aged. I’m thinking they are going to get a lot of use and wear. Just a thought. 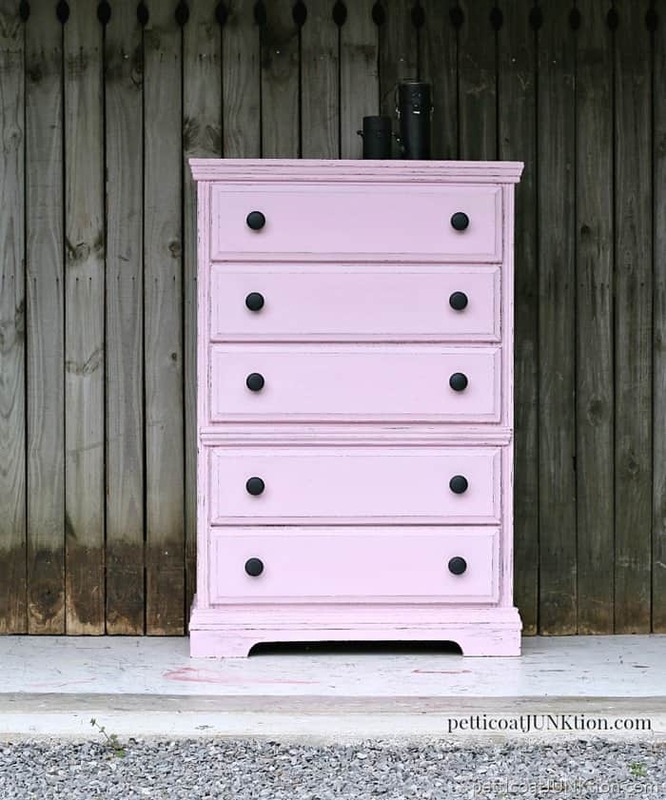 Thank you for sharing your adorable dresser! im also interested in how you achieved the black color, when you distressed the pink. Did you just paint the areas black, where you distressed? I think the pink & black look great! Can’t wait to see what you all used! 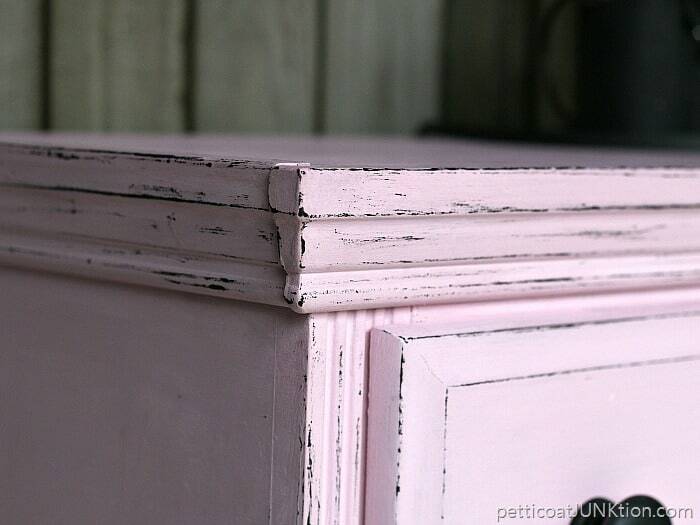 Love the distressed pink! Black knobs make it pop! Looks great! 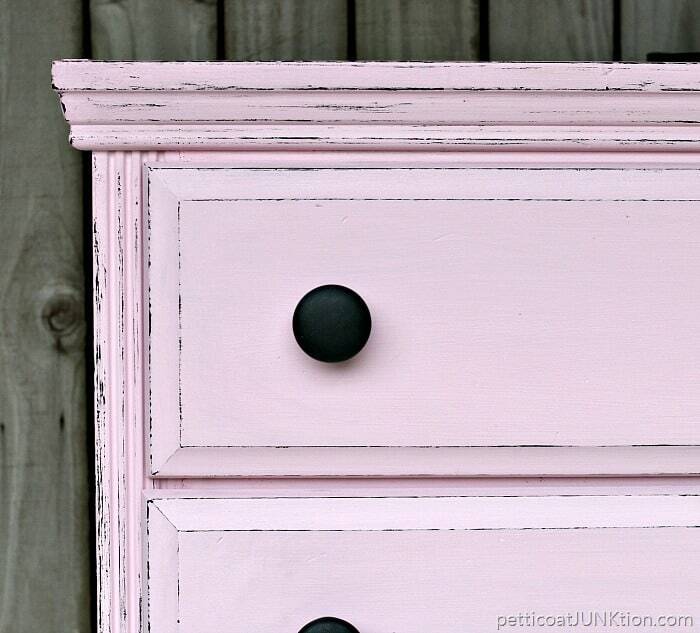 Love the black knobs with the pink! I love this look! Makes the pink more sophisticated! I was wondering if you painted the piece all black first and then the pink to give it that look? I love pink and black! Yes, Kathy, I do like the contrast with the black distress and the black knobs. 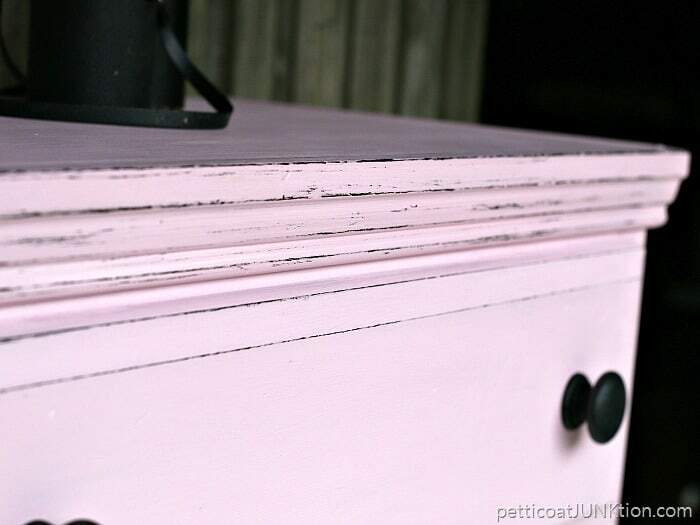 This is truly a good makeover – and yes, this paint is better than the original finish! Good job! Give yourself a pat on the shoulder since I can’t reach you. I love it….pink is my absolute favorite color! My craftroom is this same pink. The painters did t even fuss! Lol. The rest of the house is soft greens, aloe bluish green, but my craftroom is my sanctuary so pink it had to be! I would love to see large crystal knobs as a possibility for the chest. But, the black knobs really open the gate for accent pieces! You really do great work! Can’t wait to see the next entry on paint choice and process! Love the pink!!!!!! Brave look but very nice! LOVE the color combo! Pink and Black is so Audrey Hepburn!!!! Also, I like the light distressing. Great project Kathy! Did you base coat in black first? What type of paint is this? Thanks for sharing! I am so going to do this. Thanks for the inspiration.